Amaze your friends with the Magic 34 trick! 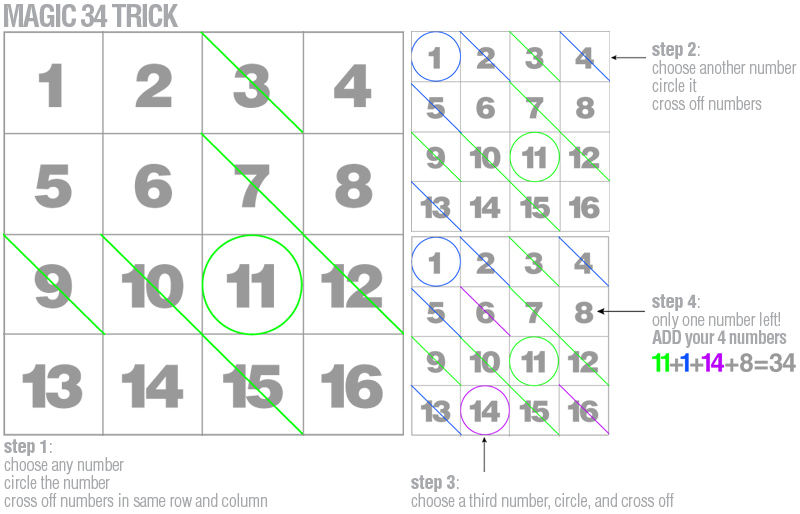 All you need is a grid with numbers 1 through 16. First, gather an audience and choose a volunteer. Next, say that you are a math mind reader and you can predict the sum of the four numbers they choose. Pretend to think, then, write the number down and put it in your pocket. 1. Have them choose a number on the grid and circle it (any number). 2. Then, they cross off the numbers in the same row and column as the number they circled. 3. They keep choosing a number and crossing off the numbers in the same row and column, until they get 4 numbers. 5. They add their 4 numbers and you pull out the number (you wrote down) from your pocket. Is it 34?! Visit Learn With Math Games for the explanation behind this trick and for more math mind reading tricks!